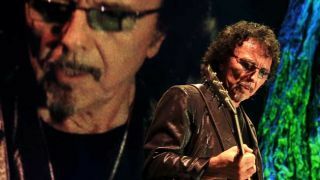 Tony Iommi: new signature on the way, but what exactly? MUSIKMESSE 2015: Epiphone has posted a not-so-cryptic clue to their biggest artist release at this year's Musikmesse: a Tony Iommi signature SG. Accompanied by a shot of Uncle Tone, the guys at Epiphone say "We can't wait for musikmesse next week. We will be unveiling a pretty cool new model. Any guesses?" The post is made even less cryptic by the news article on Epiphone's website, announcing Iommi signings at Musikmesse, and that a new Iommi model will be released this summer. It's not yet clear whether this will be a straight reissue of the hugely popular Tony Iommi G400 SG, or another iteration, but we're excited. Musikmesse kicks off next Wednesday, and we'll be reporting live from the show floor. Check back for the latest gear news!